The amount of 0.78 USD has been deposited to your account. Accounts: U17230075->U1651590. Memo: API Payment. Withdraw to IncredibleEarnings from Sports Traders Group.. Date: 13:48 30.11.18. Batch: 237778565. The amount of 1.04 USD has been deposited to your account. Accounts: U17230075->U1651590. Memo: API Payment. Withdraw to IncredibleEarnings from Sports Traders Group.. Date: 20:59 30.11.18. Batch: 237815688. The amount of 2.08 USD has been deposited to your account. Accounts: U17230075->U1651590. Memo: API Payment. Withdraw to IncredibleEarnings from Sports Traders Group.. Date: 04:12 04.12.18. Batch: 238470468. The amount of 0.78 USD has been deposited to your account. Accounts: U17230075->U1651590. Memo: API Payment. 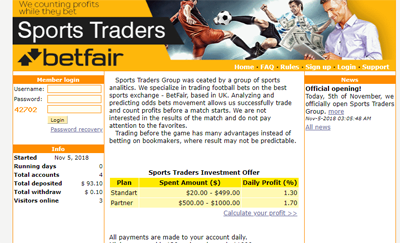 Withdraw to IncredibleEarnings from Sports Traders Group.. Date: 10:58 05.12.18. Batch: 238616319. The amount of 1.56 USD has been deposited to your account. Accounts: U17230075->U1651590. Memo: API Payment. Withdraw to IncredibleEarnings from Sports Traders Group.. Date: 10:43 08.12.18. Batch: 238925189.